Weeks passed since Anchan and Shuka got back together. They were both back to normal lives with the rest of Aqours. It was a perfectly good day for all the girls. A perfectly good day to even go somewhere since their livestreams just ended and the director just gave them the rest of the week off. "I say let&apos;s go!" King said, tilting her head upwards with pride as if she really was the proud King of an empire. "I second that &apos;let&apos;s go&apos;" Aikyan added doing the same thing as King. Rikyako got Aikyan&apos;s "let&apos;s go" already so without further hesitation Rikyako also said "Same here!" A lot louder than her normal voice which only Aikyan seemed to notice and smiled at her. "Y-you two, your arms are awfully heavy!" Aiai complained to which the two said girls just shrugged it off. "Sounds fun!" And grabbing on to Suwawa&apos;s arm. "Great! We just need Shuka and Anchan to agree. Speaking of which where are those two anyway?" Aiai said while scanning their surroundings for any sign of the said girls. The third years look at each other with a grin as if they don&apos;t even need words to tell the other what they were thinking. "Im pretty sure they&apos;re on a date somewhere nearby" Arisha said while still grinning. "Those two lovebirds" Aikyan and King both said in unison while mentally facepalming themselves. "For now, let&apos;s go in groups and search for them? Not like we have much to do now anyway" Rikyako suggested and Aina gave her a really evil grin. "Then, if we&apos;re going in groups, Aika you go with Rikyako. I go with Suwawa. Arisha, Aiai, and King you three go together" Another evil grin towards Rikyako&apos;s way. "I don&apos;t really mind" Aikyan answered first which Arisha&apos;s "Same here" followed to. "Then it&apos;s decided! Let&apos;s go Aina" Suwawa took Aina&apos;s hand and went out. "Let&apos;s start looking too Rikyako" Aikyan did the same and went after Suwawa and Aina. The three people who are left sweatdropped. "Come on you guys, let&apos;s go" before going out and Aiai and King following after all. 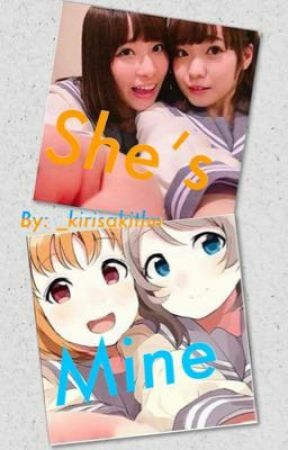 "Just admiring the view" Anchan smiled which Shuka mirrored and gripped Anchan&apos;s hand and went closer to her to lean her head on Anchan&apos;s shoulder. Anchan reciprocated the gesture by resting her head on top of Shuka&apos;s.
They both stayed like that for a while, wrapping themselves in comfortable silence and enjoying each other&apos;s company while looking at the breathtaking view. Aikyan and Rikyako went to the nearby cafes and saw not a strand of Shuka and Anchan&apos;s hair anywhere. "They&apos;ll probably show up soon" Aikyan casually replied. The both of them walked farther till Aikyan saw a truck that sells crepes. "Say Rikyako, wanna take a break for a while?" Aikyan asked and Rikyako just nodded in agreement. They both went near the truck. "I&apos;ll have chocolate" Aikyan followed after. A few minutes passed and both of them got their crepes, sat down and ate their crepes in comfortable silence till they both finished. "We should probably start looking again" Rikyako said looking at Aikyan. Aikyan giggled at her much to Rikyako&apos;s obliviousness. "W-what?" Rikyako flinched. Aikyan just smiled and reached towards Rikyako&apos;s face. Rikyako closed her eyes in embarrassment only to feel Aikyan&apos;s hand slide over just above her mouth. When she opened her eyes, Aikyan&apos;s index finger was already inside her mouth. "GEEZ!" The flustered Rikyako then stood up and stomped her way to wherever her legs could take her.